I spent about a half an hour roaming around the produce section of Whole Foods the other day, trying to find the makings for an interesting salad. The first thing I saw was the edible flowers. I absolutely love how they look. Many edible flowers are quite peppery and pleasantly floral. However, the box I bought had some varieties I had never tried, and I knew some had the possibility of being bitter. If that were so, I didn’t want to add fruit to the salad, as I was afraid it might contrast too strongly against the bitter flowers and create some discordance. Instead I went with a more analogous flavor scheme. I also LOVE jicama! I chose vegetables ranging from peppery radishes, to nutty mâche, and finally to my beloved sweet jicama. I introduced some fruity tang later with the vinaigrette. 1. Toss mâche with vinaigrette and set aside. 2. Arrange radish slices in a circular pattern on a plate. Top with jicama, cucumber slices, and mâche. 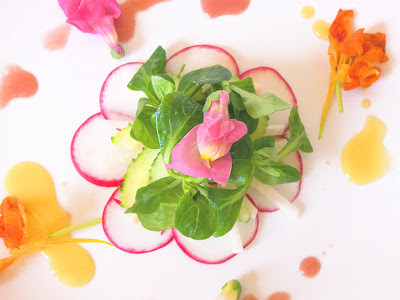 Garnish plate with more vinaigrette and flowers. medium gorgeous and godlike are eating tonite!